I love that song. If fact, here it is for your viewing and listening pleasure. Ok then, back to the food. 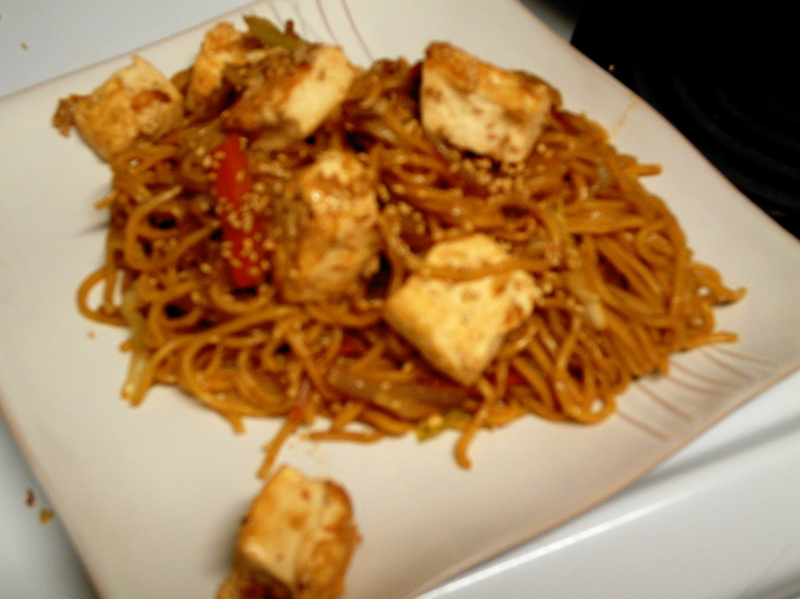 This was one of those Ok, I Have Some Yakisoba Noodles and Random Vegetables So Let’s Throw Them Together “recipes”. So let’s get to it! 1. First, I said a word of thanks for living in a town with a Trader Joe’s because they have organic tofu for well under $2/lb. 2. Then I cut one block into cubes. Yeah, I know my cuts were kinda uneven. Oh well. 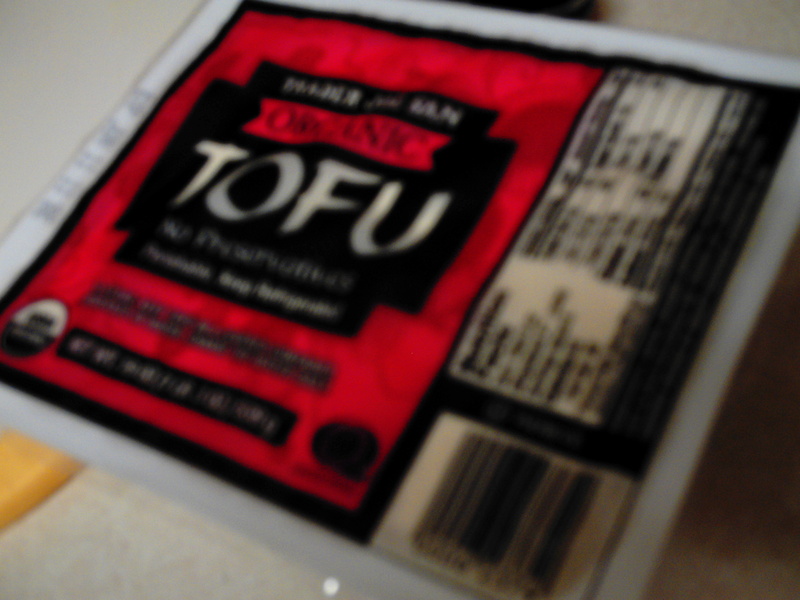 While I was cutting the tofu I was heating about 1 Tbs. oil (canola and corn blend, but use whatever you want as long as it holds up well to heat) in a large skillet. 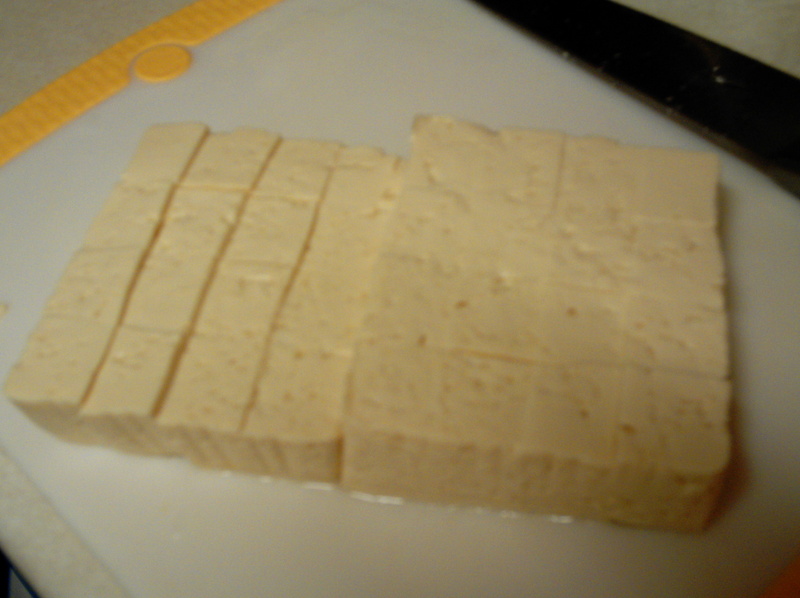 Just a note here about tofu – if you have time and you’re planning on browning it, press it first. You’ll get much better results and it won’t stick to the pan as easily. I was in a hurry so I didn’t do it this time. 3. I added the tofu to the skillet, giving it a quick shake to keep the cubes from sticking and cut 2 medium carrots into strips. Kind of like wide matchsticks, but feel free to cut them however you want. Go on…go crazy. 4. 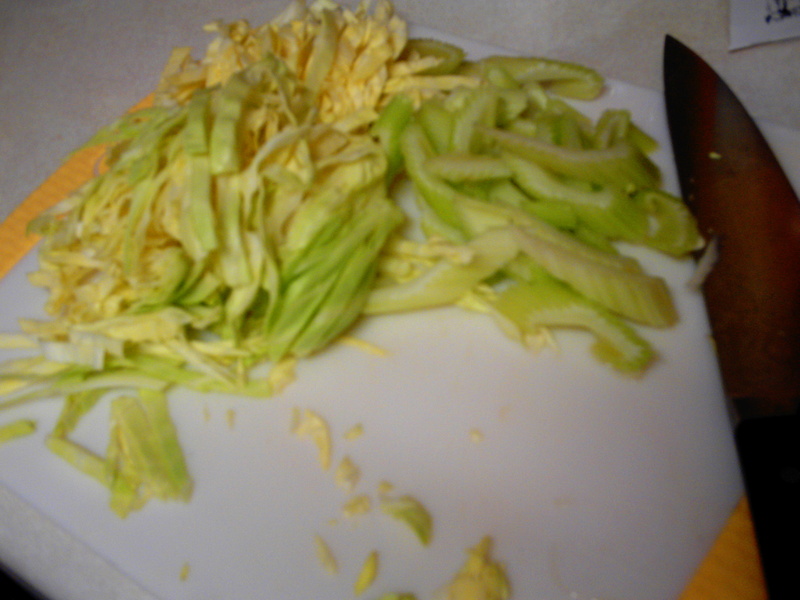 Then I sliced 1 yellow onion into strips about 1/4 – 1/2 inch wide. I also check on the tofu because it was starting to brown. Once most of the moisture has evaporated from the pan it’s important to check it every few minutes so it doesn’t stick. Or you could use something other than tofu. Whatever you want. 5. 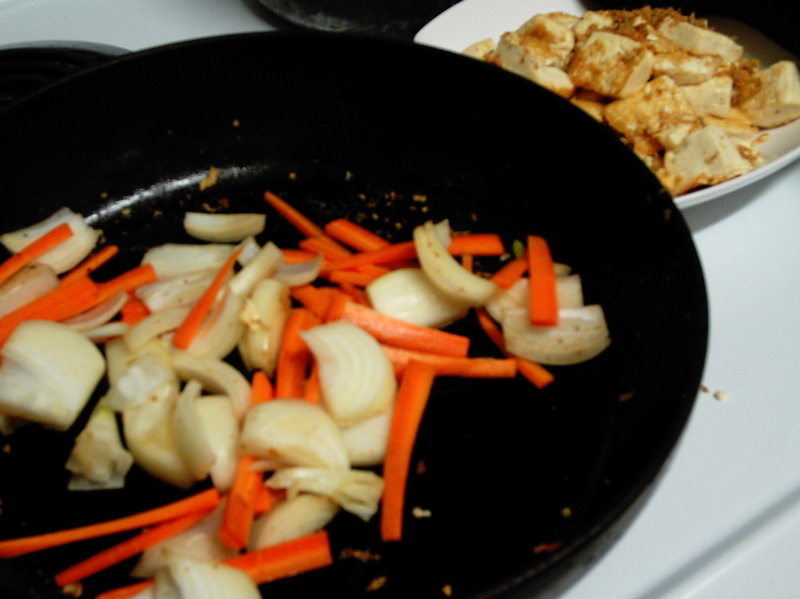 Once the tofu had browned on most sides I removed it from the pan before adding the carrots and onion because this was a particularly soft block and I knew it would fall apart if I left it in while cooking the other ingredients. If I had mushrooms I would’ve used them, too, but I used them all in the Turkey Tetrazzini the other day. 6. 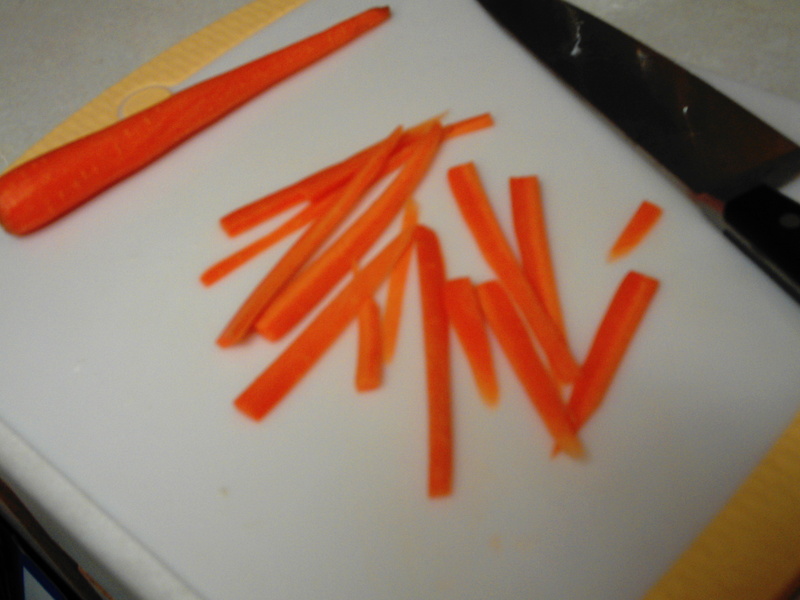 While the carrots and onion softened on medium heat I cut 2 large celery stalks and about 3 cups green cabbage into thin strips. Some other veggies that would be nice to add if you have them on hand are zucchini, Napa cabbage, baby corn, water chestnuts or snow peas. 7. 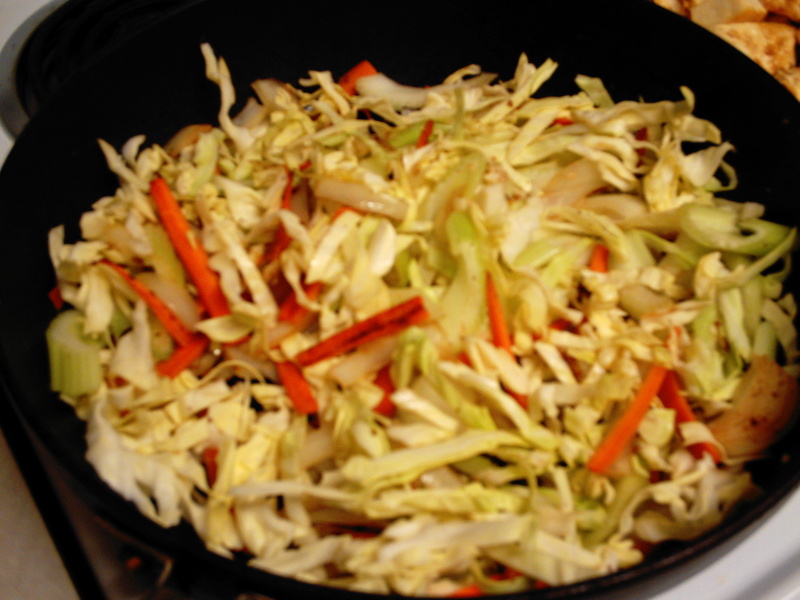 I added the cabbage and celery to the skillet (I’d love to have a wok, but don’t have room to store it) and continued cooking it all for a couple of minutes. 8. You may be wondering, “Where’s the garlic? ?” Don’t worry, it’s coming. 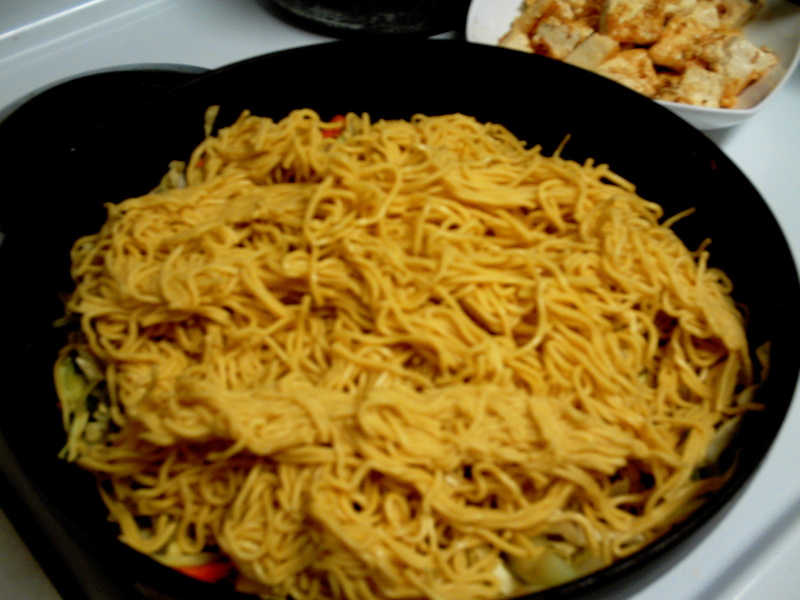 Next I broke up the noodles a bit with my hands before placing them on top of the veggies. I don’t know the exact measurement of the noodles, but I got them at Costco and they come in a two pack. I used one of the packages. 9. Let me just apologize in advance for this section. I made the sauce while the noodles steamed over the veggies and just like every other time I’ve made this I didn’t measure anything except for the 1/4 cup light soy sauce I used as the base. I added maybe 1 Tbs mirin, 1 Tbs sugar, 1 tsp seasoned rice vinegar, 1/4 tsp ground ginger (fresh is so much better, but I didn’t have any), 1/2 tsp black pepper, 6 cloves minced garlic (fresh, that I minced myself) and enough water so the whole thing equalled 1 1/2 cups. Just be sure to taste the sauce before adding it to the pan. It’s a lot easier to adjust before it’s mixed in. I stirred it until the sugar dissolved then poured it over the noodles, mixing it in and breaking up the noodles with the spatula. 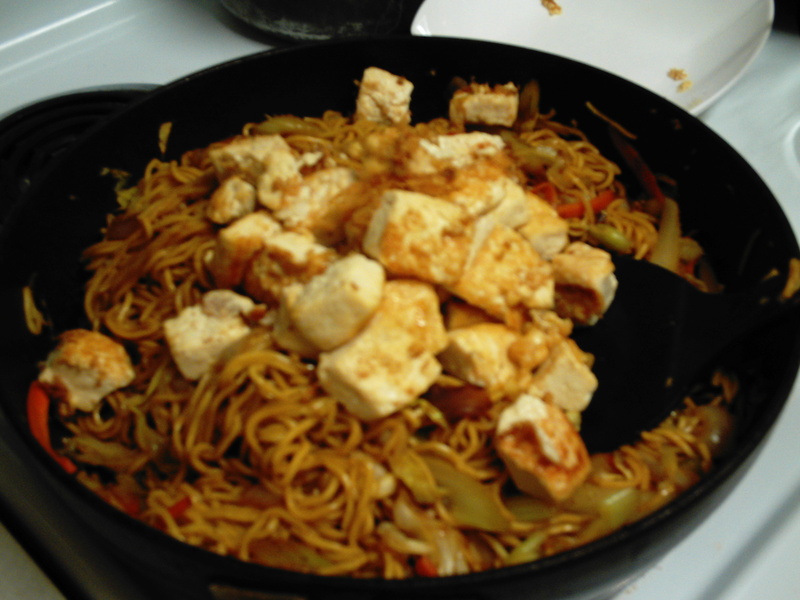 Then I added the tofu back to the skillet and tossed with the noodles and sauce, heating the whole thing through. 10. I topped the finished product with sesame seeds. Yumm! This one’s a family favorite.